Spain is one of Europe’s most popular and sought after countries with several different geographical and cultural regions. The capital city of Spain is Madrid, and the country boasts a beautiful coastline replete with stunning private beaches, hot summer sun, and vast seaside resorts. If you’re looking for a perfect vacation in which you can while away your days soaking up the hot Spanish sun while taking a swim in crystal blue waters, this is where you need to be. In this article we’ve reviewed the top 15 beach hotels in Spain so you know just where to be. 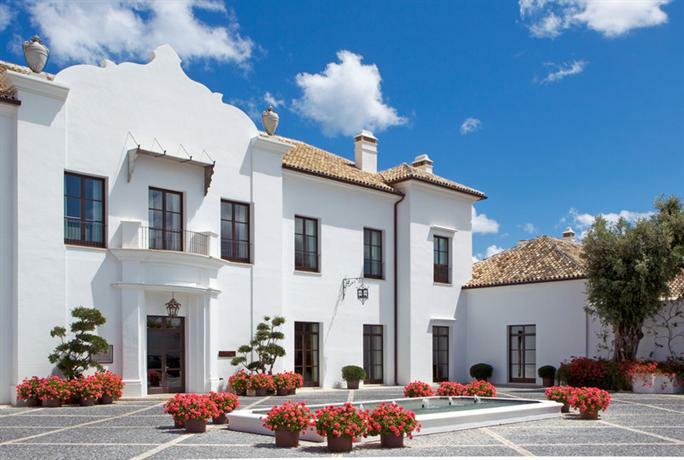 Finca Cortesin Hotel Golf & Spa is located at the bottom of the Sierra Bermeja, and it’s set off against the coast of Marbella, close to the pretty neighboring village of Casares. 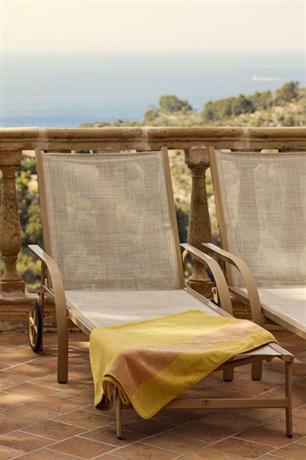 This resort offers sweeping views of the Mediterranean and the surrounding regions. The hotel also comes with a beach club located just a short 5 minute away on foot. If you like exploring, there are plenty of popular tourist attractions within close quarters, such as — Puerto Banus, white villages in the mountains, and Gibraltar. If you’d like to explore a few other beaches, you can also go to Tarifa and Costa de la Luz. As you can see, the Finca Cortesin Hotel is very strategically located so as to give you the best view, and access to not just the best beaches, but also all the other neighboring sights and attractions. Even though the hotel is quite new and has only recently been built, it looks like it belongs to the 17th century, or like it has been converted from an old convent. This is a decision that has been made in order to make the hotel look periodic and grand, and the mirage works wonders. There are two pools in the hotel, and they’re both surrounded by lovely fresh-scented gardens and emerald tiles. One of the pools is 30 meters long and comes with a kid’s pool next to it. This is meant to be used by families with kids. However, the other pool is 50 meters long and it’s Adults-only in case you want some peace and quiet. The most popular attractions in the hotel is the restaurant Don Giovanni. 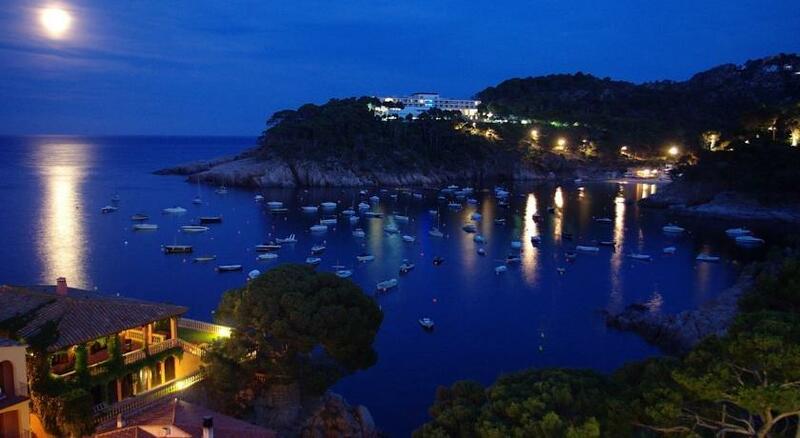 Hostal de La Gavina is located a short 5 minute stroll from Sant Pol beach. If you’d like to explore some of the surrounding regions, you can drive down the Camino de Ronda coastal path to reach the seaside towns of Santa Cristina d’Aro and Sant Feliu de Guixols, both of them 10 minutes away from the hotel. Additionally, the same path will also take you to two separate golf courses if you’re looking for some activity. The hotel has been designed in an antique and dated style, everything about it reads old school glamour. The reception room is oval in shape, and the floors and pillars are inlaid with marble. Furthermore, the room is also full of antiques, high ceilings, and floral arrangements. The hotel also features a lounge and a library area with vast and heavy volumes of reading material. There’s a large outdoor pool which offers stunning views of the sea as well. The hotel is surrounded with well maintained and lush gardens that also surround the pools. Some of the other great facilities in the hotel include a heated pool, a whirlpool, sauna, steam rooms, gym, hammams, etc. There are 55 rooms and 22 suites in the hotel and they all feel grand and palatial in stature, and they’re designed quite ornately with parquet floors, patterned wallpapers, and wardrobes and furnitures that are all hand-painted. However, if you want a room with a view of the sea, you’ll need to ask for it specifically as some of them only have partial views and some look out at the garden. 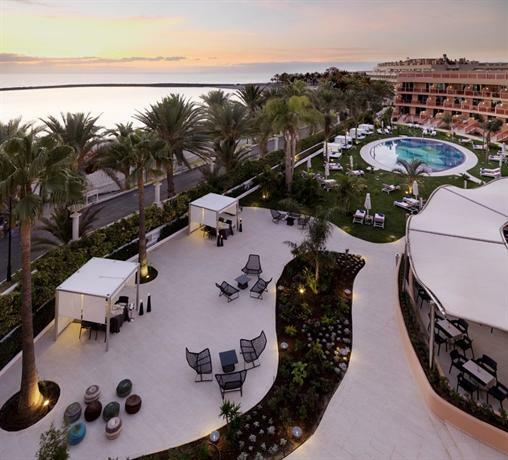 Seaside Grand Hotel Residencia is located in Gran Lujo, on the fringes of Maspalomas. The hotel has been built on ancient palm groves, and it’s adjacent to Charca which is a stunning lagoon and home to migratory birds. The hotel is quite strategically located. It’s a short 5 minute stroll from the beach, and it’s also connected to the rest of the region via a series of public transportation options. For example, the bus station is located 2 minutes away and it can take you to Puerto de Mogán, aeropuerto, or Las Palmas de Gran Canaria. This hotel is designed in such a style that nothing goes higher than two floors. The reception in the hotel also features a lounge area and a library, and if you climb up the stairs you can find the restaurant with a terrace. The villas in the resort are all two-storeys high, and they’re all whitewashed and draped in bougainvillea. As such, the resort comes with a predominant color palette of beige and greens. If you check into one of the upper storey suites you can also enjoy a grand and sweeping view of the dunes below and the mountainous terrains above. The ground floor rooms look out at the garden, but they don’t have much else in the way of a view. The furniture and the bedsteads are designed in tough hardwood oak, however the real attraction lies in the bathroom which features a transparent bathtub with massage jets installed. The in-house restaurant offers á la carte dinner, and sometimes they even have a barbecue buffet. The piano bar in the hotel offers a number of cocktails. Hotel Aigua Blava looks out at the Aiguablava bay. The hotel is quite well located, and well within close proximity of several prime attractions of the region such as Fornells, Malaret, Platja Fonda, and Aiguablava, all within a 10 to 20 minute walk from the hotel. If you’re got a car, you can also drive down to Begur within 15 minutes. The hotel comprises a string of buildings designed in a manner that’s both contemporary and modern and still folds in old-school influences. The common areas are especially designed in a charming antique style with Spanish pottery used as ornaments, and the presence of several impressionist oil paintings gracing the walls. The bar is all made of hardwood, and it features pictures of their most historic guests such as Kirk Douglas and Rock Hudson. The hotel also has its own hair salon and a jewelry boutique. There are several additional amenities in the hotel such as an outdoor seawater pool, a children’s playground, and a series of courts for tennis, volleyball, and table tennis. There are 85 rooms in the hotel and they’re all designed in a light and breezy style with a slight nautical theme to it. The predominant colors in the rooms are white wood, light wood, and teal shades. Depending on the room you choose, you can either enjoy a view of the sea or of the gardens. 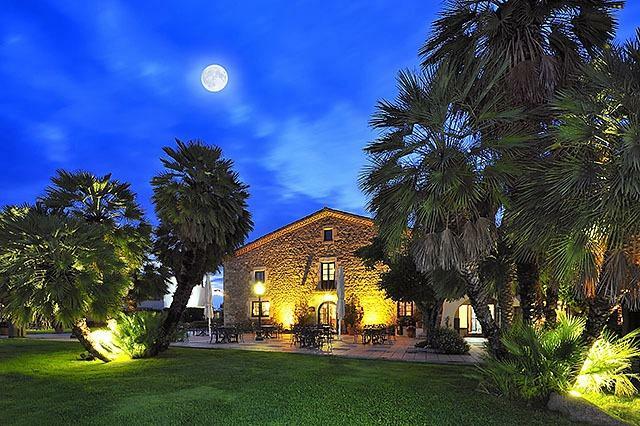 Es Moli Hotel is one of the most romantic hotels in the region, located on the mouth of the charming village Deia along the northwestern coast of Majorca. As such, the hotel is ideally placed to enjoy grand sweeping views of not just the charming hill town, but also the Balearic sea. The walk to the town is through a dusty dirt road, but it takes only 10 minutes to get there. The hotel bears an impressive 17th century façade, and it’s decorated with grand columns and balconies that give you a stunning vista of Sierra de Tramuntana. The hotel is painted in white, however it bears wooden and orange accents to add some warmth and personality, and there are several potted plants around the premises to add a little life. The furnitures in the room are designed in a hardwood aesthetic and they’re made to look quite antique, and the doors allow plenty of natural light into the rooms. The hotel has its own private rocky beach called Muleta Cove, in case you want to take a dip in the sea in some privacy. One of the best features of the hotel is the meal offered in the restaurant which comes in large portions and all artistically plated. Hipotels Flamenco Conil is a lovely beach hotel designed in an Andalusian aesthetic. It has some great amenities in place such as an outdoors and an indoors pool, a paddle tennis court, and direct access to the beach. All the rooms in the hotel are luxuriously designed, however only a few of them are sea facing. Guests are encouraged to relax on the poolside terrace and the garden is lush and features several sun loungers. Furthermore, the gym also comes with a spa and a hot tub. The rooms in the hotel are designed in a bright aesthetic juxtaposed with dark hardwood accents. There’s one buffet restaurant which serves varied international dishes, and there’s also a poolside and a piano bar. 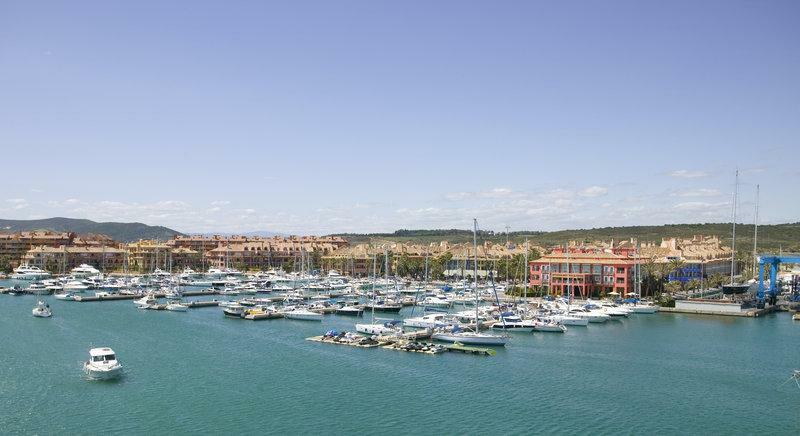 Club Maritimo de Sotogrande is located on the Sotogrande Marina, and it’s a short 3 minute stroll to the beach. It has the pleasure of looking out at the Gibraltar, Morocco and the Mediterranean Sea, and the hotel premises also features one of the best golf courses in all of Europe. There are two restaurants in the hotel, one of them meant for snacks and the other for Mediterranean meals. 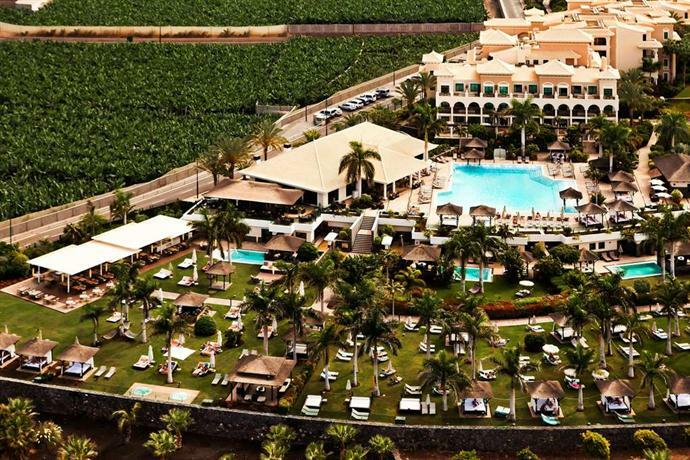 RedLevel at Gran Melia Palacio De Isora is located a short 10 minute drive from Los Gigantes, and it’s 20 minutes from the popular Siam Park. It’s located on Playa Jaquita on the southwestern coast of Tenerife which is known for being remote, quiet, and peaceful. As such, this hotel is ideal for people looking for a relaxing getaway. The rooms in the hotel are designed in a combination of ochre, earth green, and other similarly earthy shades, juxtaposed with contemporary details such as designer lamps and mood lighting. You can get rooms either facing the ocean or the garden. 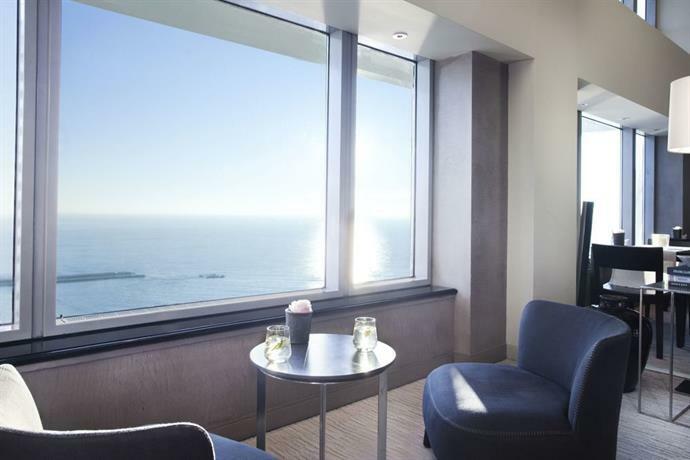 The ocean view rooms also feature a whirlpool on the balcony. Salles Hotel Mas Tapiolas is located on a private stretch of land surrounded by the woods of Ardenya hills. The hotel also offer a hazy view of the Gavarra mountains in the distance along with a Medieval monastery. The rooms in the hotel are designed in a modernist style with neural tones of white and charcoal grey, and the rooms are all minimally decorated. The bathrooms also come with comfortable fleecy bathrobes and bath slippers. 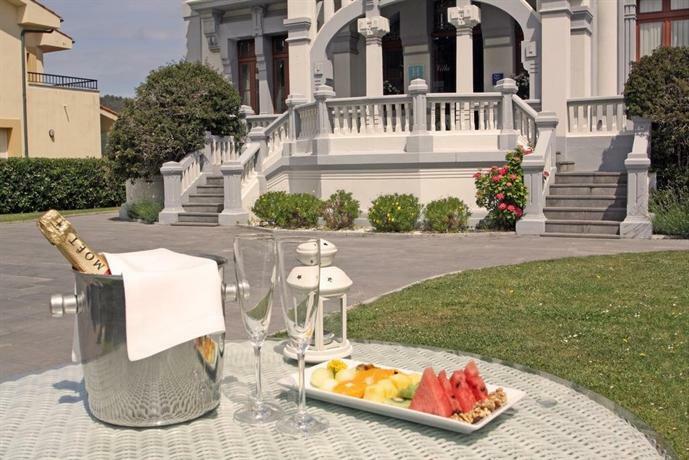 Hotel Villa Rosario is located on the Asturian coastline, smack right on the beach itself. Most of the rooms in the hotel enjoy a stunning view of the sea, and the hotel itself is surrounded by the Ribadesella Mountain on the other side. The hotel is quite old and as such it bears some antique markings, however those characteristics have been preserved and it has been adapted to modern needs. The general decor of the hotel is classy and minimalist and the color palette is neutrally maintained with beige, grey, and white. If you’d like to partake in some activities, you can go kayaking or snorkeling in the sea, or you can go to the neighboring golf course or explore the prehistoric caves. Sir Anthony Hotel is located on Camisón Beach in one of Tenerife’s most popular locations Playa de las Américas. 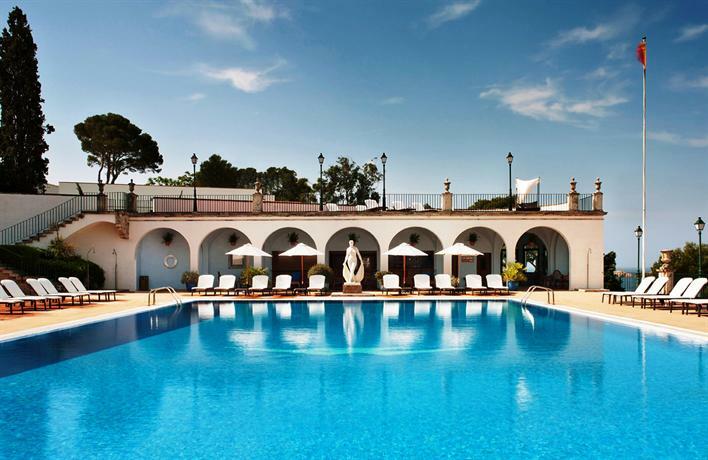 The hotel is extremely chic and stylish and it comes with a spa and an outdoor pool. The rooms are all luxurious with parquet floors and modern decor, and they enjoy a view of the ocean. Some of the neighboring attractions to the hotel are the Las Américas Golf Course and Siam Park, both of them a mere kilometer away. While the hotel doesn’t have a spa of its own, you can go to Mare Nostrum’s spa right next door. Hotel Arts Barcelona is a wonderfully minimalist and chic hotel that looks out at the Barceloneta Beach on one side and the Barcelona city centre on the other. Barcelona’s Olympic Port is right next to the hotel, and the beach is at a distance of 250 meters. The rooms in the hotel are designed in a luxurious contemporary style with large windows that allow plenty of natural light to flood in, and the use of natural earthy shades such as beige, brown, and crisp white linen. 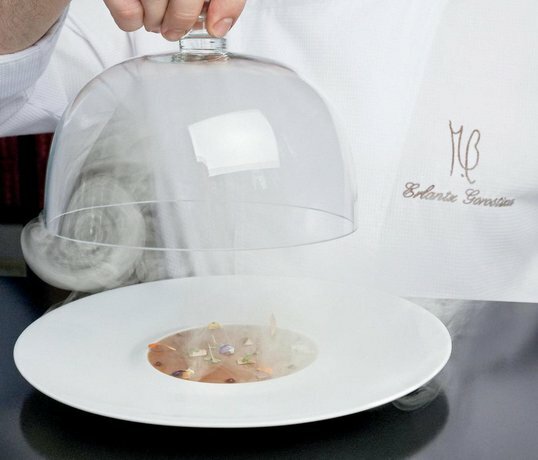 One of the highlights of the hotel is its 2 Michelin star Enoteca restaurant known for its brilliant Mediterranean cuisine. 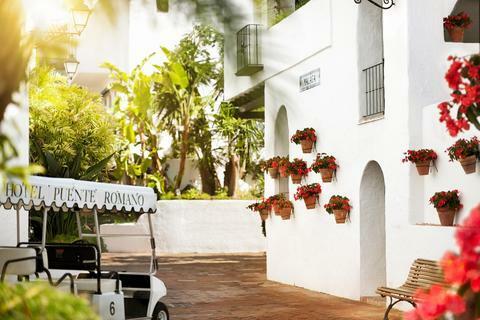 Puente Romano Beach Resort & Spa is located in Marbella, a short 4 minute walk from the beach. It’s a sea facing hotel and it also has several other luxurious amenities such as a tennis court, several different swimming pools both outdoors and indoors, and a treatment center. The hotel is famous for its 2 Michelin star restaurant, along with its pool bar, beach restaurant, and in-house disco. The rooms are designed in a pleasing color palette of lime greens, beige, and white with full-length windows looking out at the sea or the gardens. The Ritz-Carlton Abama is located on a cliffside on the southwestern coast of Abama, looking over at the neighboring island of La Gomera. The hotel has been designed in a tropical style with plenty of gardens, trees, etc, that span out across the accommodations providing an illusion of privacy and solitude. There are 10 splendid restaurants in the hotel, and as such you can have any variety of dishes you please, be it local Canarian, or Argentinian, or any other. 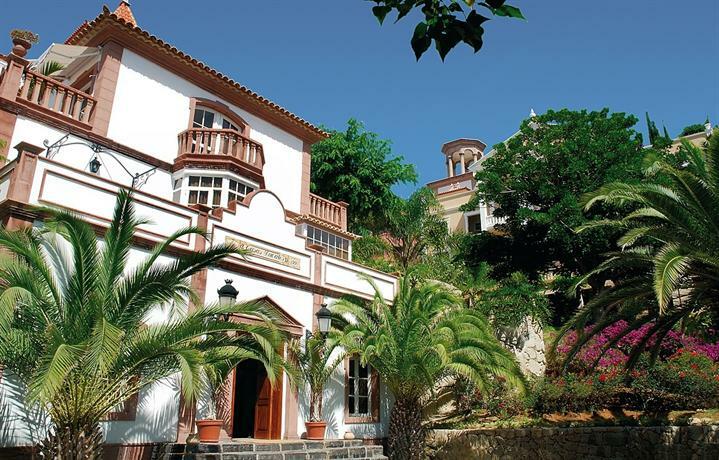 Gran Hotel Bahia Del Duque Resort is located a short 4 minute walk from the beach. It looks out over at Duque Beach, one of the most popular beaches in Tenerife. The resort itself is surrounded by 6 hectares of tropical gardens and flora. There are 5 outdoor pool options in the hotel, and the rooms come with private balconies from which you can look out at the gardens or the sea. There are 8 restaurants in the hotel, and they offer cuisines from across the globe, be it Oriental or Italian.